Climate change is a globally complex issue and there are genuine areas of uncertainty and scientific controversy. However with an increase in record temperatures, the melting of Arctic ice and a rise in CO2 there is little doubt our climate is changing. Among the profound impacts of climate change now being investigated is its affect on ecosystems around the globe and the fact the world appears to be getting greener. These issues, including carbon accumulation in vegetation, have been widely discussed in the scientific literature and official reports. The Met Office’s Professor Richard Betts looks at the coverage of this in the IPCC 5th Assessment Report. A recent paper (Zhu et al, 2016), attributed the observed worldwide greening of vegetation largely to the fertilisation effects of increased carbon dioxide. This paper was published after the IPCC 5th Assessment Report (AR5), but had the issue already been discussed in AR5? Yes – quite prominently and extensively. The Summary for Policymakers (SPM) of the Working Group 2 volume on Impacts, Adaptation and Vulnerability features observed land ecosystem changes prominently. The first figure of results in the SPM (reproduced below) gives an overview of observed impacts of climate change, including a number of examples of terrestrial (ie: land) ecosystem changes. The table accompanying that figure explains each of the impacts depicted on the map. 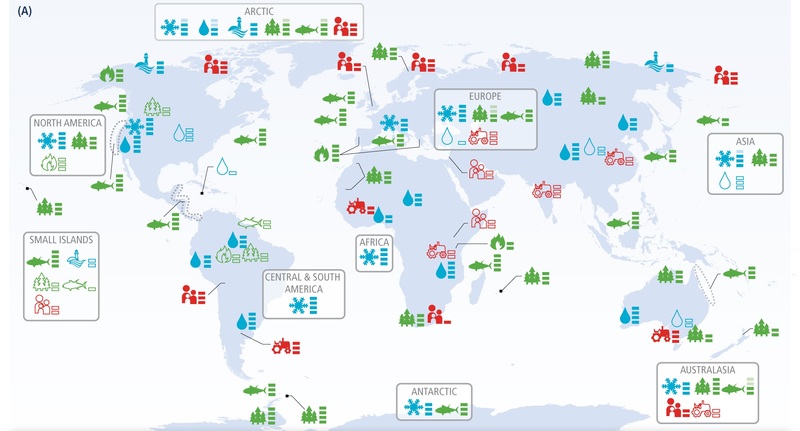 Many of these clearly relate to observed greening across the world. Terrestrial and freshwater ecosystems have sequestered about a quarter of the carbon dioxide (CO2) emitted to the atmosphere by human activities in the past 3 decades – Chapter 4, Executive Summary. There is high confidence that the factors causing the current increase in land carbon include the positive effects of rising CO2 on plant productivity, a warming climate, nitrogen deposition, and recovery from past disturbances, but low confidence regarding the relative contribution by each of these and other factors – Chapter 4, Executive Summary. Evidence since AR4 confirms the stimulatory effects of carbon dioxide (CO2) in most cases – Chapter 7, Executive Summary. Across all climate zones and continents, the major role of climate change and increasing atmospheric carbon dioxide (CO2) on terrestrial and freshwater ecosystems has been confirmed by new and stronger evidence – Chapter 18, Executive Summary. Basal area measurements at more than 150 plots across the tropics suggest that biomass and growth rates in intact tropical forests have increased in recent decades (Lewis et al., 2009). This is also confirmed for 55 temperate forest plots, with a suspected contribution of CO2 effects (McMahon et al., 2010). Satellite observations analysed in Donohue et al. (2013) suggest that an increase in vegetation cover by 11% in warm drylands (1982–2010 period) is attributable to CO2 fertilisation. – Cross-Chapter Box VW (page 158). Satellite observations from 1982–2010 show an 11% increase in green foliage cover in warm, arid environments (where WUE is most important) after correcting for the effects of precipitation variability (Donohue et al., 2013); gas exchange theory predicts 5 to 10% greening resulting from rising CO2 over this period – Chapter 4 section 4.2.4.4. Carbon dioxide (CO2) is an essential building block of the process of photosynthesis. Simply put, plants use sunlight and water to convert CO2 into energy. Higher CO2 concentrations enhance photosynthesis and growth (up to a point), and reduce the water used by the plant. This means that water remains longer in the soil or recharges rivers and aquifers. These effects are mostly beneficial; however, high CO2 also has negative effects, in addition to causing global warming. High CO2 levels cause the nitrogen content of forest vegetation to decline and can increase their chemical defences, reducing their quality as a source of food for plant-eating animals. Furthermore, rising CO2 causes ocean waters to become acidic (see FAQ 6.3), and can stimulate more intense algal blooms in lakes and reservoirs – Chapter 4, Frequently Asked Question 4.2. In summary, there is high confidence that net terrestrial ecosystem productivity at the global scale has increased relative to the pre-industrial era. There is low confidence in attribution of these trends to climate change. Most studies speculate that rising CO2 concentrations are contributing to this trend through stimulation of photosynthesis, but there is no clear, consistent signal of a climate change contribution – Chapter 4. The final draft of the main report was released on the same day as the SPM. The issue of land carbon uptake and increased biomass were also discussed in the Working Group 1 volume on The Physical Science Basis, both in that volume’s SPM and the chapter on Carbon and Other Biogeochemical Cycles. Recent suggestions that this issue was downplayed in IPCC AR5 are therefore incorrect and misleading. This entry was posted in Met Office News and tagged carbon accumulation in vegetation, carbon dioxide, climate change, climate science, CO2 levels, Global Greening, global warming, Met Office Hadley Centre, photosynthesis, rise in CO2. Bookmark the permalink. I assume that this article was partially a response to Matt Ridlley’s ridiculous “lecture” at the latest GWPF tribal gathering as reported in the Guardian yesterday. 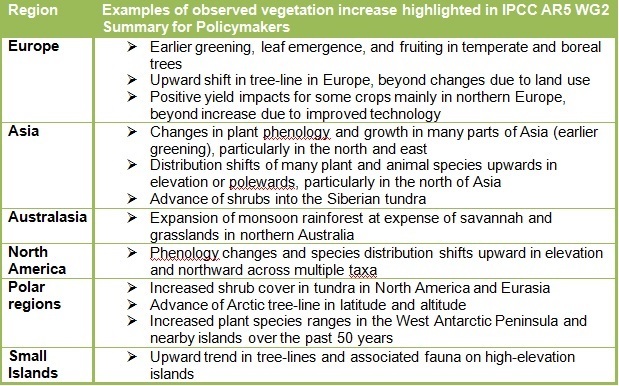 Our blog post focussed specifically on the issues that have recently been discussed regarding the observed expansion of vegetation cover and the coverage of this in the IPCC AR5 report, and the table presented relevant statements from the report’s Summary for Policymakers (SPM). There was no statement relating to this specific issue in Africa in the report. This does not imply that there are no impacts in Africa, just that this specific point was not listed in the SPM. There is an entire chapter on Africa in the report, with many impacts discussed, and many of them are listed in the SPM – it is just that this particular point was not made in relation to Africa in the SPM. All of the world’s oceans are alkaline. Nowhere is ocean water acidic. A reduction in alkalinity can occur but nothing can be classed as acidic or more acidic until it is, in fact, acidic. And, like our bodies, the oceans are chemically buffered against pH changes. In our bodies and the oceans it’s the carbonate/bicarbonate buffer. Secondly, yes, the Earth sequesters carbon. Fact. During the last Ice Age, the very existence of major plant groups was threatened by atmospheric levels of CO2 reaching 180ppm, due to the efficiency of photosynthesis and the low decomposition rates at cooler levels and the fact that most of the original atmospheric excess was then still buried in the ground. Most plants die at 150ppm. At 400ppm like today the benefits to plants are becoming apparent. Anyone worried about toxicity at these levels should ask commercial growers why they often raise CO2 levels to around 1200ppm to stimulate growth. From the original ~30%CO2 atmosphere largely plant driven sequestration of CO2 has driven levels down to hundreds of ppm. The evidence of this is the buried biomass deposits we dig up and burn (the much ‘feared’ hydrocarbons) Replacing some of the otherwise ‘lost indefinitely’ carbon from which, unless it becomes atmospheric ‘cannot become’ again, plants or animals, or then become, after a long and pleasant life, dead plants and animals to be burned by our bodies or combustion to become more atmospheric CO2. It’s symbiosis. A beautiful existence. Almost as if it had been designed. Next to nothing leaves the planet, and as long as the Sun shines the energy to drive the process of recycling is endless. Wrecked of course by the false association of CO2 with global warming rubbish. The climate is, and always was, and always will be changing. Nothing to do with CO2! Oh good grief. The Greenhouse Effect is established science. Is this all you have to offer? No, not really, but thanks for asking. So let’s see. This pseudoscience says that back radiation from CO2 warms the oceans. Warm oceans release CO2. Raised vapour pressure of dissolved gases. Henry’s Law and all that. The raised CO2 then heats the ocean, which releases CO2. Perhaps you are the one to explain why the back radiation in Earth’s energy budget diagrams at twice the power of the Sun is unavailable for work or power? 330W/m-2 downwelling long wave (unavailable for work or power) back radiative rubbish, vs 168W/m-2 solar available for photosynthesis, concentration to 5800K by concentration, photovoltaic electron emissions, generally entropically viable spontaneous process. Some mythical unusable downwelling flux has been spoon fed to ‘jo public’ that is twice the power of the Sun. I don’t quite understand why the MetOffice is posting about this in the first place, as it doesn’t seem to volunteer a clear explanation. However, if it is indeed a polemic in response to an absurdly contradictory polemic by some other organisation (GWPF) – as suggested in comments above – then why not say so? Jolly well substantiate the absurdity, point-by-point and blow them away, or maybe better yet, get the IPCC to speak up for itself. I was unaware that the MetOffice was funded to be some kind of defence, or mouthpiece or echo-chamber for the IPCC. Some people might say that the MetOffice should stick to its knitting and not embroil itself in unilaterally making semi-formal “authoritative” opinion statements attempting to refute contrarian arguments in public debate, regardless of how daft it may consider such speech by other parties, and I’d be inclined to agree. As a scientist and a contributing member of society, I for one find it disquieting that there is a suggestion that we might need to be told – propaganda-like – what’s right and what’s wrong, or how/what to think, by taxpayer-funded organisations or NGOs – and that might include (say) the Royal Society or the BBC, when/if they fit the bill in that regard. The history of the UK would seem to indicate that the quiet and level-headed democracy-loving majority of British people, from all walks if life, will generally be perfectly capable of independently seeing through any fallacious/unsubstantiated arguments put forward by proponents of this and that in a nationally important debate, and thus be generally able to draw their own conclusions and may become suspicious of those pushing invalid positions – e.g., including prime minister Neville Chamberlain’s appeasement policy, or science that does not pass the falsifiability test (science must be falsifiable). In the event of one finding oneself in a minority of opinion/belief and that a majority of public opinion in a democracy goes against what what one considers to be “right”, it will be pretty telling and counter-productive to then start slagging off (ad hom) that majority with suggestions that they are variously stupid, senile, racists, liars, uneducated, ignorant, or “not right-thinking”, etc. – e.g., as seems to have been (to our shame and the BBC’s) the case in the Brexit referendum. Similarly in the climate change/global warming debate, if the public are given some honest-to-goodness unadorned and straight-up facts backed up by hard scientific observations that conclusively show something important, they will get the message. Goodness knows there is an abundance of such hard data from climate research. However, if that is subsequently followed up by revelations of what might rather look like a collection of shambolic failings – unsound research, seriously shonky pseudo-science, misleading stochastic chicanery, deliberate alarmism or vague “levels of confidence” statements as appeals to authority on things decidedly uncertain – most/all of which factors would seem to have occurred (e.g., including “Climategate”, “28Gate”, “An Inconvenient Truth”) – then people will presumably tend to quietly draw their own conclusions. This would be predictable and unsurprising. What could one expect? The IPCC is a subset of a political body and is presumably performing to precisely meet the terms of the charter upon which it was established (i.e., based on a political direction). The IPCC has arguably apparently done itself and all of science a great disservice – it is still encumbered by the fallout from apparently allowing/encouraging the occasion of the types of various failings mentioned above, and it’s previous leader had apparently shown himself to have been unscientific and to have feet of clay and he’s now gone – under a cloud of disgrace. Certainly, the greening benefits of atmospheric carbon dioxide enrichment (AKA “the gas of life”) were covered in AR5, but their significance seemed to be understated/buried in terms of the political summaries – presumably because they were unwanted as they risked diluting the strength of the political imperative that a summary NEEDED to convey – and there’s nothing necessarily wrong in that, if it’s a.pukka political document – because that is what it probably needed to be focused on anyway. However, it would be incorrect to call AR5 summary statements rigorously scientific, and if they had been then they would have probably failed to meet their political objectives. I could be wrong, of course, but, If what I suggest above is generally correct, then the Met Office – perhaps inadvertently – seems to be involving itself in what could be deemed to be siding in a political debate. Is that what the British public should expect it to be doing? And if the MetOffice does engage and continues to engage – however obliquely – in apparently biased political debate, as opposed to rigorously scientific analysis of all the arguments, then the British public will be able to draw their own valid conclusions from that. They will vote with their feet – à la Brexit. If one cannot rely on being given an objective analysis by the MetOffice on this score, then who can one rely on? There is a raft of alternatives for people to choose from, but seriously, none of them (IMHO) could be as outstandingly and consistently good as the MetOffice could be – but then, I am, of course, biased. Why did you bother writing this rubbish? The main report was published on the same day as the SPM. Relying on just a blog post by the “skeptic” blogger Paul Matthews for its support. If you want all the details of this mistake, you can find them here. The short version is the IPCC WGII SPM was released on March 31st, 2014 while the “main report” was not released until October 15th, 2014. What was released on March 31st other than the SPM was a draft version of the final report. This draft version was not the final version (it was the “final draft”). It underwent a number of changes before becoming the final version. That this was the “final draft” version of the report and was fairly close to what the final report turned out to be does not mean it was in fact the final report. It is wrong to say it was. Matt Ridley was correct on this point. You are correct regarding the use of’published’ in this context. The chapter information was available at the time the SPM came out, not 6 months later, so it is more accurate to say “The final draft of main report was released on the same day as the SPM.” and the blog has been changed to reflect this. it is more accurate to say “The final draft of main report was released on the same day as the SPM.” and the blog has been changed to reflect this. The main report was released on the same day as the SPM. Which still clearly refers to the released document as being the “main report.” That is untrue. A draft version of the report was released on that day. The actual report was not released for another six months, during which time it underwent revisions, some of which were significant. Changing the word “published” to “released” in no way addresses the fact what was released was only a draft version of the report rather than the actual report. Nuworld 3 All English Matters 1 – game over. Debates are not won on the number of posts, but by sticking to facts. Something the GWPF doesn’t do. I believe you said that the ‘greenhouse effect’ is ‘established science’. No, it is an unproven hypothesis. There is no evidence of the effects of long wave radiation in modifying the tropospheric thermal profile of any planetary atmosphere. Highlight where you require evidence.